Mumbai, April 4: With Muslims in India observing Shab-e-Meraj yesterday, the countdown to Ramadan or Ramzan 2019 has begun. Shab-e-Meraj, the night when Prophet Mohammad travelled to heaven, was observed yesterday with Muslims holding special prayers. Shab-e-Meraj also marks the culmination of Rajab month. Once Rajab month ends, Shaban month will start followed by Ramadan. According to the Islamic calendar, Ramadan month will begin from the first week of May 2019. An Islamic new month begins upon the sighting of a crescent moon on the 29th day of the ongoing month. If the moon is not sighted, the month completes 30 days. Ramadan, the ninth month of the Islamic calendar, begins after Shaban. Today on April 4, it is 28th of Rajab, the seventh month. If we assume, the moon will be sighted on 29th of Rajab and 29th of Shaban as well, then Ramadan will begin from 6 May 2019. If Ramadan begins from May 6 and the moon is sighted on 29th of Ramadan, then Eid will be celebrated on June 4. 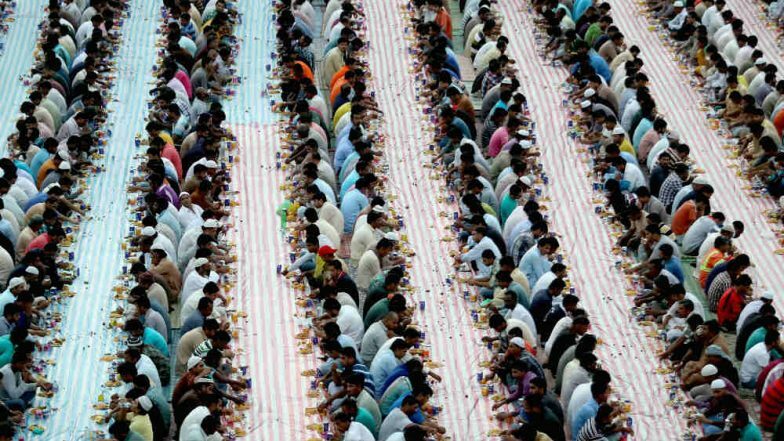 If Ramadan begins on May 6 and the fasting month completes 30 days, then Eid will be celebrated on June 5. These dates may vary if a crescent moon remains invisible on the above-mentioned dates. Therefore, over 30 days are left until Ramadan 2019. Eid after the completion of Ramadan is the first among the two major festivals celebrated by the Muslim population across the globe -- the other being Eid al-Adha.